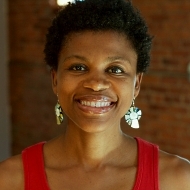 Guerda (pronounced G-air-da) is a multifaceted health and wellness practitioner and transformational coach. She is passionate about empowering and inspiring others to develop deeper level of self awareness, to explore and tap into their own power, wisdom and healing potentials. Guerda's experience in wellness and alternative health practices extends over decade. She spend many years working with bodies assisting people with chronic pain and stress management. Through her work as a bodyworker, Guerda became aware of the intricate connections between the mind, the body and spirit and how the body stores our emotions and untold stories. Guerda discovered in many cases there was almost always an emotional component or some history of trauma related to physical pain. With this insight and the desire to bring a more wholistic approach to her work, she went on to study various healing modalities. Through her own healing journey and assisting others on their healing journey Guerda also became aware of the innate wisdom of the body and that we all have the capacity to heal and live the life we truly desire. One thing that is required on this journey is the courage to dig deep, look at the limitations of our stories and have willingness move beyond our wounded stories. And that is the work Guerda is passionate about, helping people heal from the wounds that keep them stuck, in pain, and feeling powerless so they can live with more ease joy and abundance. Guerda holds a Bachelors in Exercise Science and Masters in Mental Health and Counseling with a specialty in Trauma. She is also a Massage Therapist trained in various bodywork modalities such as Reiki, Craniosacral Therapy and Somato-Emotional Release, Kripalu Yoga Teacher and JourneyDance Facilitator.